COHEED AND CAMBRIA have released a new video for the track "Island". The official video features an unlikely friendship between two Time Square comic book superheroes busking - ahead of the premiere of the upcoming Batman V. Superman movie release. The video comes as the band is midway through an extensive and nearly sold out headlining tour and just a few months after the release of their eighth full length album, The Color Before The Sun. Lead singer Claudio Sanchez is no stranger to comics - as COHEED AND CAMBRIA's latest album marks a bold departure from the beloved The Amory Wars, a seven-album science fiction saga that also bore a comic book empire. Sanchez is also a staple of the comic book scene and a regular at San Diego Comic Con, inviting his fans to come out to signings. He felt it appropriate to create this video as an homage to both New York City and his favorite characters. "When I think of these two iconic characters, I think of opposite attraction" says Sanchez. "I think of myself and my wife. How two opposite ends of a spectrum can create harmony and balance. In one way or another, these characters have been paired up with like-minded love interests, the Bat and the Cat... The Alien and the Amazonian... I wanted to bring the Dark and the Light together." 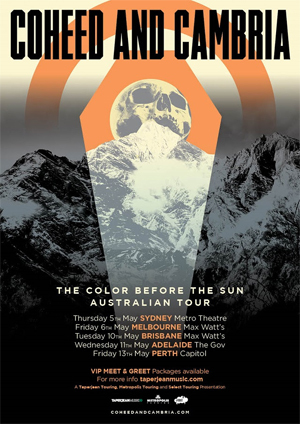 COHEED AND CAMBRIA will be heading to Australia this May for a headline tour. For ticket information go HERE. Capturing the world’s attention with their trademark mix of momentous guitar riffs, wild percussion, formidable vocals and contagious hooks, COHEED AND CAMBRIA have cemented themselves as one of the most thrilling, notable, and distinctive acts of its era. After traversing the outer limits of science fiction over seven acclaimed concept albums, COHEED AND CAMBRIA’s latest offering The Color Before The Sun marks the band’s first non-conceptual album and the first to be recorded live in the studio. Founder and songwriter Claudio Sanchez explores his emotions nakedly, plainly and unabashedly. COHEED AND CAMBRIA continue their love affair with Australia by bringing their signature sound down under once again, serving up a selection of musical delights both new and old from their storied career spanning over two decades.